It was an image every bit as haunting as Allan Donald freezing in the semi-final of the last World Cup. 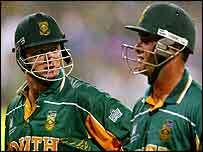 Mark Boucher had just clubbed Muttiah Muralitharan over long on for six and then celebrated the shot that he - and all his team-mates - believed had carried South Africa through to the Super Sixes with a clenched fist. The reality, however, could not have been more different. Boucher had carried out his instructions to the letter by getting his side up to 229 by the end of the 45th over. What he wasn't to know, though, was that someone in the South African dressing room had been misreading the Duckworth/Lewis sheet that gives the teams the targets in the event of rain. The 229 that they had believed was the winning total was in fact the score for a tie and only a win would have seen South Africa progress. The hosts were in fact out of the competition. "From the piece of paper, the message was that we needed 229," an ashen-faced Pollock admitted after the match. "We were trying to keep them (the batsmen) updated as much as possible. "In fact at the start of the next over, Nicky Boje was to run out to give them a Duckworth/Lewis sheet but he was stopped by the umpires who were bringing the players off the field. "It is something that we are going to have to live with and try to get over but it is going to take a long time." Longer, most probably, than most South Africans will take to forget the sight of Boucher prodding the last ball of Murali's over defensively into the leg side. His job, he believed, was to preserve his wicket in order not to alter the Duckworth/Lewis requirement. A single run would have been enough to earn South Africa a win. "So close again," Pollock said. "To go out to two ties in two World Cups. It's hard to describe. "Once we found out that 229 was for a tie - and we knew that 10.45 was the cut-off - all we could hope for was that the rain would stop. "In fact it got to the stage where it was raining as it had been when we were playing. "There is no rule which says that you can't start when it is spitting." After being eliminated from the 1992 tournament when a ludicrous rain rule altered a target of 22 from 13 balls to 22 from one against England, and their dramatic failure at Edgbaston in 1999 against Australia, the latest chapter in South Africa World Cup nightmare has been written. "It looks like the World Cup is one trophy that will keep on eluding us," said Gerald Majola, the chief executive of the United Cricket Board of South African Cricket. Where did it all go wrong for SA? Is Smith the right choice?